So today we kicked off our sampling of restaurants in and around Charlotte, North Carolina. Today’s choice was Big Ben British Restaurant and Pub. Located in Atherton Mill on the south side of Charlotte, this pub had great food in a sports bar environment. When we arrived only a few tables were taken, but unknown to us, a Chelsea vs. Manchester City soccer match was about to start and the place was buzzing with people within 15 minutes. We started with the Bubble & Squeak appetizer. This traditional English dish consists of mashed potatoes and sautéed brussel sprouts, but here they substituted cabbage. The dish had a great consistency and was very tasty. For our meal, my wife went with the Famous Southend Haddock N’ Chips and I took our waiter’s suggestion, the Chicken Pot Pie. The Chicken Pot Pie was definitely a unique dish. Rather than the traditional pot pie served in some universal type of container, this pot pie was formed inside of an exceptional puff pastry type shell which held in all of the goodness of the dish. 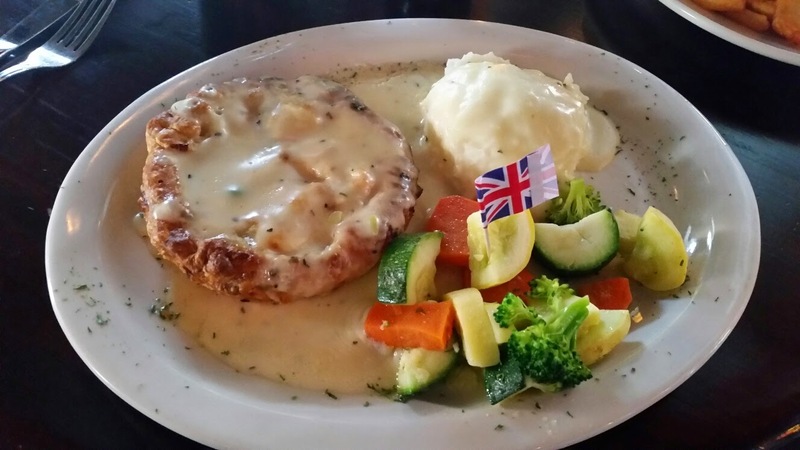 It was served with fluffy mashed potatoes, fresh steamed vegetables, and topped with chicken gravy. The Haddock N’ Chips was far larger than most persons could eat at one sitting. Luckily, my wife was willing to share. 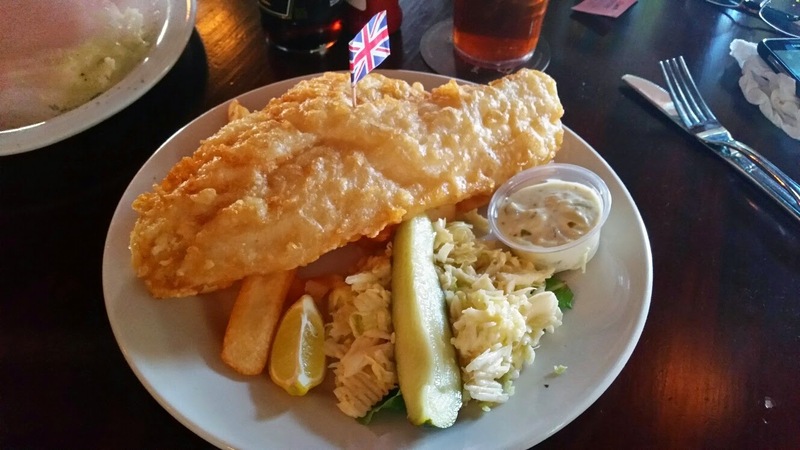 It consisted of flaky haddock, cooked to perfection, crispy pub fries, cole slaw, and a pickle that they call a Wally which in England means a “dill pickled baby cucumber”. The fish was great, not greasy nor overly fishy. The pub fries were cooked flawlessly, crispy on the outside and soft on the inside and the average cole slaw complemented the dish. So, our takeaway…if you’re not a soccer fan, ask to be seated outside the viewing area of the huge screen or you’ll feel like you’re at the game. And go early. We snagged a parking spot right in front, but when we left, vehicles were lined up, circling. Oh, and if you like a coffee after your meals, be sure to stop in Not Just Coffee, located on the back side of Icehouse right next door and wander around the indoor farmer’s market. I would rate this establishment 5 spoons out of 5 for a family friendly restaurant serving outstanding food. Dora here, adding my two cents about this first experience. 2. Bring the list. Since we didn’t bring our list, we had to switch gears. 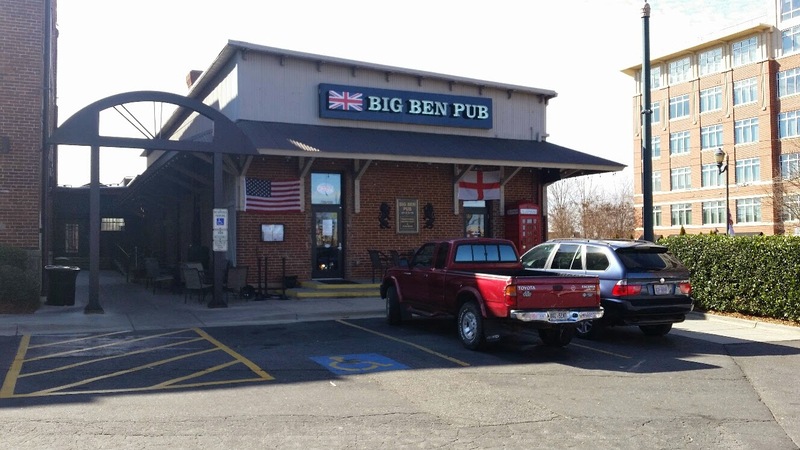 With a little help from Yelp, Big Ben Pub ended up being a fabulous alternative. 4. Leave the dog at home. In the cooler months, Bruiser enjoys tagging along with us. So long as we have a container of water and leave the windows cracked, he’s happy. We didn’t think it would be a problem to find a parking spot in downtown Charlotte on a Saturday, but we were wrong. Rather than park in a garage a few blocks away, we chose to drive a bit farther out of downtown where parking was more accessible and Bruiser was close. Overall, I thoroughly enjoyed our first Excited about Eating venture. Do you enjoy experimenting with new restaurants? Or do you prefer to frequent the same ones? ← Adding a VIP to my blog! I love to try new restaurants (when budget allows!) and new foods. If I ever get back to Charlotte, I'll have to try it out. I'm a little afraid that my to-do list for Charlotte restaurants may become unwieldy if all Ernie's reviews are this mouth watering! Excuse me while I go to my fridge to get something to eat! Thanks Robbye, we will keep the reviews coming every Saturday.